Manchester United have reportedly enquired with Bayern Munich over the possibility of signing centre-back Niklas Sule during the summer. 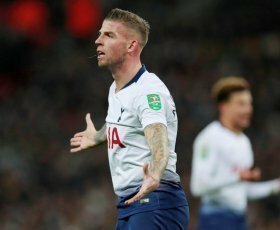 Arsenal have reportedly thrown their name into the hat to sign Toby Alderweireld from cross-town rivals Tottenham Hotspur at the end of the season. Manchester United have reportedly earmarked Tottenham Hotspur's Toby Alderweireld as their prime defensive target for the summer owing to the relatively cheap release clause on his contract. Manchester United have received a boost in signing Napoli star Kalidou Koulibaly with the Senegalese switching his agent to push through the exit door at the Stadio San Paolo. Juventus are preparing a transfer swoop for Belgium international defender Toby Alderweireld in the summer transfer window. According to reports, the Tottenham defender is available for a fee of around £25 million. Leicester City have reportedly instructed Manchester United to pay up a world-record £90m fee for a defender to pursue Harry Maguire this summer. Manchester United have reportedly received a boost in the pursuit of Barcelona defender Samuel Umtiti ahead of the summer transfer window. Manchester United are reportedly regarded as favourites to pursue Toby Alderweireld from Tottenham Hotspur at the end of the ongoing campaign. Arsenal and Tottenham Hotspur could reportedly go head-to-head to pursue the services of Fabian Schar from Newcastle United during the summer transfer window. North London giants Arsenal and Tottenham Hotspur could reportedly go on a bidding battle to sign Matthias Ginter from Borussia Monchengladbach this summer. Manchester United have reportedly made up a list of defensive targets they are likely to pursue when the transfer window reopens at the end of the season. Manchester United have reportedly expressed their intention to secure the signature of Kostas Manolas from AS Roma during the current transfer window. Bayern Munich defender heading to the Premier League? Chelsea and Tottenham Hotspur are understood to have held discussions with the representative of Mats Hummels with the defender said to be considering his future at Bayern Munich. Napoli president Aurelio de Laurentiis has confirmed that Manchester United had recently made a club-record bid worth £95m for Kalidou Koulibaly which was swiftly rebuffed. Manchester United boss Jose Mourinho has reportedly urged the club to make a fresh attempt to sign Toby Alderweireld when the transfer window reopens. Tottenham Hotspur midfielder Eric Dier has reportedly emerged as a potential target for Barcelona ahead of the transfer window at the turn of the year.